I am an experienced phpstorm user and am very happy with the product. 2. 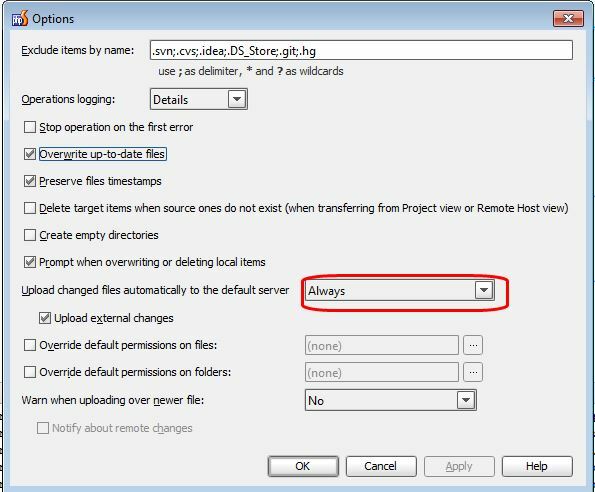 I have my deployment server options set correctly so my expectation is that the CVS changes made by other users (which have resulted in my local source being modified) will automatically be uploaded to my deployment server - but they are not. 3. Instead I have to manually select Upload to <my deployment server> - which seems to copy ALL files and is very time-consuming - I want to avoid this step. 1. Why is item 2 above not working? is this the expected behaviour? Is item 3 really necessary? Note 1: I do NOT wish to manually synch and compare as suggested in the help text, I simply want my default deployment server to automatically be kept up to date when I update from CVS. Note 2: When I make changes to my local source, the changes are automatically updated to my deployment server so my configuration is working just fine (Deployment - Automatic Upload is set to Always). It's other users' changes from CVS that are not being auto-uploaded. But, at the same time, that first ticket is still open .. so there still must be something to implement. See if Synchronize button (or File | Synchronize) will do any good here (force rescan of local files). BTW, the upload options seems to be OK.
1. That really does not answer the question at all. If you do not have VCS then you cannot test or address this issue. 2. I looked at the Issues you referenced in your post - from 3 years ago - and I do not believe the issue has been addressed. Some user commented that this is one reason that he still uses Netbeans. 3. The Upload external changes setting checkbox is checked and should do exactly what I'm looking for but it does not work. 4. The synchronise option has nothing to do with this issue. Some user commented that this is one reason that he still uses Netbeans. That comment left on "21 Aug 2010 05:45". Upload external changes checkbox has been added on "24 Jan 2011 10:20" (5 months later). Did I said otherwise anywhere? I've confirmed that your settings are correct and it should work. Do you actully know what I'm talking about (File | Synchronize) and what it supposed to do? Where did I mention word "option" anywhere? Two comments stated that upload did not started until IDE refreshed the list of project files -- "File | Synchronize" does exactly that. That's why I have suggested to try it in case IDE have not noticed those changes. Cannot hep you -- I do not work for JB. I guess I should keep my mouth shut next time instead of trying to provide at least some help. 1. My humble apologies - I DID think you worked for Jb . 2. I hope you can see that the tone of my message was one of frustration (at not being able to solve an issue I have had for a long time), rather than ingratitute. 3. I do very much appreciate your freely given help, and I followed your advice and checked out the Synchronize option - the update works (redface). Certainly beats doing an Upload all - thanks for your input.